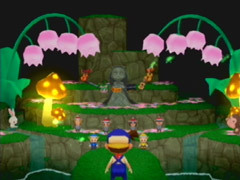 If you follow the path up through Mountain Echo Forest, you'll eventually walk into the Goddess Spring. The watery area is where the Goddess sleeps after she turned herself to stone. The three Sprites have kept an eye on her until you arrived in Flower Bud Village, and then recruited you to find the missing Music Notes. Every time you bring sets of 5 notes to the Sprites new things will appear around the Goddess statue. When you eventually bring 50 notes and the last musical instrument appears, return to the Spring to watch the Goddess make her entrance back into the world. Even though the Sprites requested that you find the rest of the Notes, you can return to the Spring at any time for a free stamina recharge! This is very handy if you happen to be chopping down trees in the Forest and you don't want to pass out. Just walk back to the Spring, get a refill on your stamina, and go back out to cut up more logs for lumber. There is no limit to how many times you can do this in a day. A good spot to cut lumber is just north of Paradise Orchard. When Ronald expands his winery, the Chestnut trees in that area are going to be wiped out anyway. Go ahead and chop them all down before Ronald gets to them!